If you’ve read the sprawling behemoth that is my critique of (now not so) recent stroke literature you’ll notice that it ends with a spiel on IST-3 – the big 3000 pt RCT that hopes to settle the question of whether or not tPA in stroke works or not. The very astute Domhnall pointed out to me that there are some things in the trial methodology that make me a little bit less optimistic than I was before. There’s a lot of good stuff on the IST-3 site if you want to go check it out. If nothing else it’s a fascinating insight into how big trials like this come to happen and how they change and morph over time. 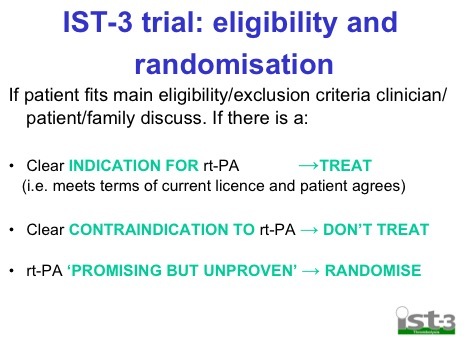 For example patients recruited into the trial changed as new evidence from ECASS3 emerged and the guidelines changed. The most important thing that I must point out is that this isn’t a standard double blind RCT in the way that NINDS was that took all comers (effectively) with stroke. IST-3 was a pragmatic trial, very similar to the way CRASH 2 was done. In CRASH 2 if you were sure the pt was actively bleeding they weren’t randomised and got TXA anyway. You only got randomised on “uncertainty.” The IST-3 folk actually describe this as the “uncertainty principle” but I don’t think it has anything to do with cats in boxes. If there was already an indication for tPA then you didn’t get randomised. So all the pts who got randomised in NINDS wouldn’t be included and when ECASS 3 got published then these people wouldn’t get randomised. So the population included in the trial drifts over time. Effectively this trial randomised pts that would have been classified as protocol violations in a lot of the prior work. I don’t mean that in a nefarious, misleading kind of way, just that over timescales like those involved in this trial (over 11 years from 1st pt to last), things rapidly change and you change course appropriately. So these are certainly pts that we’re interested in, and the trial is definitely going to answer some questions, it’s just that it’s not going to answer the same question that NINDS set out to answer as these pts didn’t get randomised. I don’t know when there’s going to be data on this but I will certainly let you know when I see it. The very fact that it completed recruitment without being stopped early (for either effect or harm) means that something interesting will come out of it.